Today I'm showing you a 'no makeup' makeup look which sounds like I am making no sense at all but I promise I will once I explain ! This is a very light coverage makeup look which is so natural that it will create the illusion that you are wearing no make up at all ! 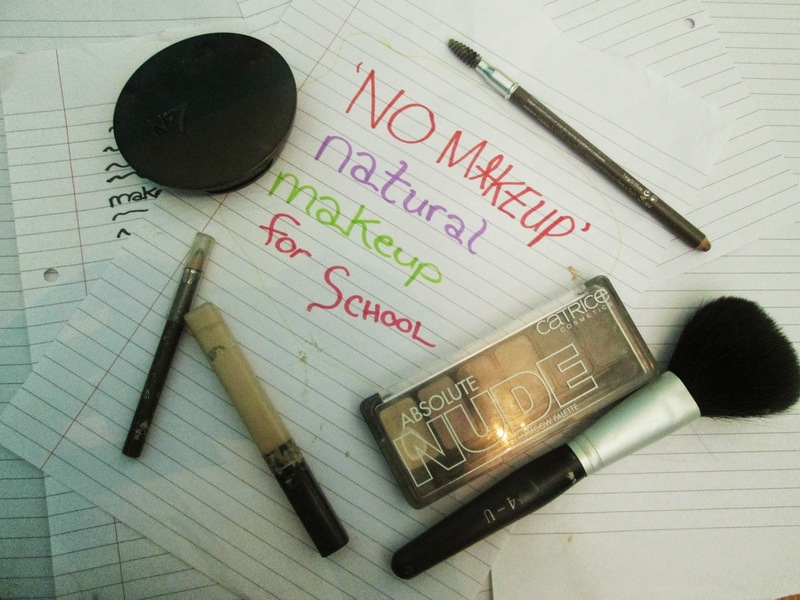 A lot of teenage girls including myself can be quite self conscious when it comes to their skin from time to time and at the same time most schools only allow natural makeup and at some makeup is even forbidden so today's makeup look will give some light coverage and is completely cake-free - Causing you to look like you're wearing nothing over your lovely natural skin ! Also, I must add this short disclaimer that I am in no way saying that you need to wear makeup if you're skin conscious. So how can I achieve this look ? Read on for a step by step ! If you'd prefer to watch me applying this makeup I uploaded a tutorial to my YouTube channel which you can watch here. 1. First we're applying moisturiser about fifteen minutes beforehand which will act as a great substitute for primer. Right now I use Garnier Moisture Match in Protect and Glow since it contains SPF 20 yet doesn't cause my skin to appear greasy at all. 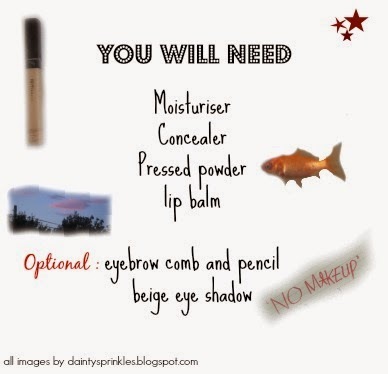 If you find your concealer is too cakey and heavy, you could always mix it with your moisturiser. 2. Next we're starting off the actual makeup look with concealer. Like I said earlier, We only want light coverage so foundation and BB cream is being dumped for concealer which we're only going to apply to our 'problem' areas very lightly using an application brush or ring finger. Everyone has different areas on their skin that they're conscious of so it's up to you where you apply concealer but I'm applying Maybelline Fit Me in Shade 15 on my eye lids and over the dark circles under my eyes and the red irritated areas around my breakout areas. I'm not too bothered over completely covering all my spots because they end up looking cakey but again, I'm not saying you have to do that ! 3. We're then going to set our concealer with pressed powder and I'm using No7 Perfect Light Pressed Powder in 05 Translucent since translucent is the only shade that doesn't turn my skin tangerine. 4. This step is optional but there's a whole fascination with filling in brows at the moment and I only fill in the gap at the end of my right brow using a 17 eyebrow pencil so I personally wouldn't fill them in if makeup was banned at my school but if you are set on filling your brows in, I'd suggest doing it as lightly as you can. Also, I find that brushing my brows out, improves the look of them immediately without even touching a pencil. Don't be too anxious over filling in every gap - We are going for a 'natural' look after all ! I'm then going to apply beige eye shadow to my eyelids since I already applied concealer here and don't want them to crease but you can skip this step if you wish to. 5. Finally, we're applying lip balm to our lips so they stay moist rather crack a-lacking all day. The Nivea Lip Butter that I use in Vanilla and Macadamia tends to wash out the pigment of my lips so if it didn't smell so good, I'd opt for a tinted lip balm instead ! This is our finished look which is very natural and cake free ! As you can see, I haven't applied any sort of eye makeup besides the tad bit of eye shadow and although some of my spots are still peaking through, the concealer has definitely calmed down the redness ! I'm not that into the back to school makeup posts and videos since I find that most people wear the same kind of makeup outside as well as inside school but I will be doing my everyday makeup routine for school soon and if there's any other back to school posts you'd like me to do please tell me in the comments. Also my post on postivity was recently nominated for Best Blog Post in the Blog Awards Ireland and it still needs your votes - You can vote for Dainty Sprinkles once a week here and I can't thank everyone who's voted enough !